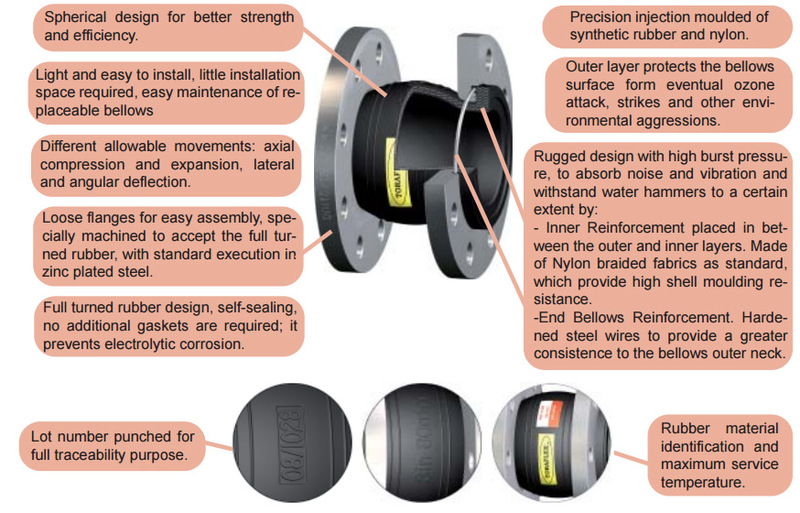 Rubber expansion Joints are flexible unions for pipes and rigid systems whose main purpose is no other tan protect equipment, avoiding rigid systems and pipe work rupture by thermal expansion and contraction, to absorb vibrations and noise generated by pressure pumping stations and also to assist with pipe alignment and being used as dismantling joints. They are consisting of synthetic rubber convolution fitted with metallic connectors at their ends, being flanges or threaded unions and are designed to perform axial movements and lateral and angular deflections. Designed and manufactured in accordance with good Engineering Sound Practice (ESP)* Patterns available for diverse convolution shape – single and double sphere – with sizes from DN 32 up to DN 1200* Rating: PN 6/10/16* MAWT: depending on rubber grade * Bursting pressure: 60 barg up to DN 200 and 40 bar on larger sizes* Flanged ends to EN 1092-1 PN 10, PN 16 or ASME B.16.5 ANSI 150 – loose fl at fl anges * Testing Standard: EN 12266-1 * Marking Standard: EN 19 * PED 97/23/CE according to Art. 3 – Paragraph 3 (Art.1.3 – 15) – Excluded from marking.